So how did the trial of peace activist Laulani Teale go today at District Court? 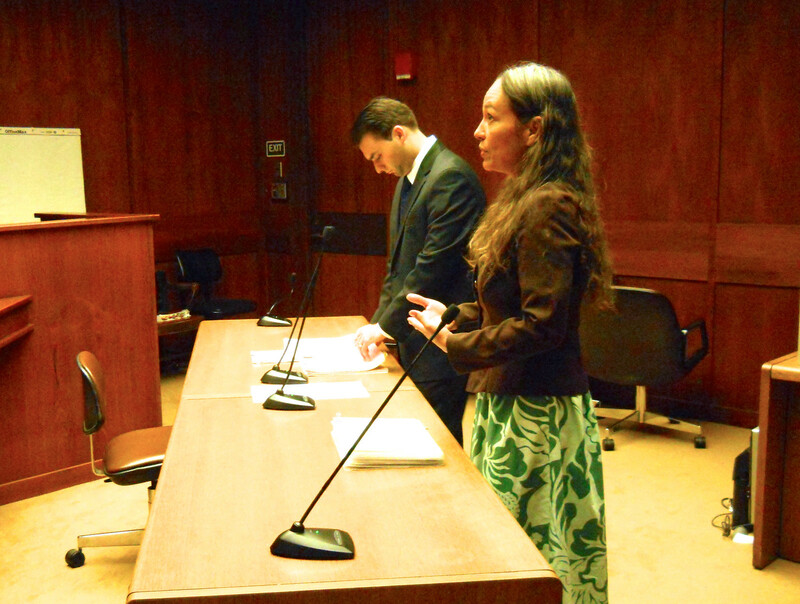 Tealeʻs first court appearance on a disorderly conduct charge was on August 24 of this year. The four officers who were subject to subpoena did not show up. If you or I donʻt show up at court, the Court issues a warrant for our arrest. In this case, they continued the trial to today. Before Teale's first Court appearance, I applied for and received an order for "Extended Media Coverage" that would allow me and Kamuela Vance Viveiros to video and photograph the proceedings. The application cited Hawaii Guerrilla Video Hui as the media organization. Viveiros and I are both founding members of the hui which was recently awarded a grant by the Hawaiʻi People's Fund and the Kim Coco Iwamoto Fund for Social Justice to continue frontline media coverage of social justice actions. Viveiros' recently competed documentary, Kalo Culture, will premier on October 13, at the Hawaii International Film Festival. Viveiros -- also an experienced Olelo producer -- showed up at Court with the digital video rig he uses to produce documentaries. It's small, portable, and high quality. I came with my streaming media rig which includes an iPhone and a Verizon hotspot for bandwidth. I routinely stream at around 1 megabit per second for high quality streaming video on the internet. Judge Paula Devens did not even let the hearing begin after finding the Court's order allowing the hui to video somehow flawed or otherwise not to her liking. She claimed not to see "television cameras." By that I assume she means the monstrously huge set ups that TV news crews use in the movies. Since Devens canʻt herself void another judgeʻs order, she scheduled a continuance to October 17, at which time the original judge will revisit his order allowing us extended media coverage, and for Laulani Tealeʻs trial to progress directly after that. So Iʻm seeing a scenario where the judge gets the not so subtle hint to disallow the hui to cover Tealeʻs trial. Just my own opinion here, but it seems to me the Court has already taken sides and decided that having the public see four big-body officers next to the rather petite Teale may make the desired guilty verdict something of an absurdity. But thatʻs something the public wonʻt see. It will have been effectively disappeared in advance. Well okay, not to leave you without something. After the abbreviated hearing, Teale revealed that she had brought through security and into the courtroom the "weapon" cited by the police officers. if due process, the judge may distort. Mahalo for another sharply pointed limerick!